It's hard to believe that Cinco de Mayo is next week! My printables have been selling like crazy, I think it's because they all focus on the REAL history behind the holiday and not just the stereotypical sombrero, piñata, margarita that most people associate with it. 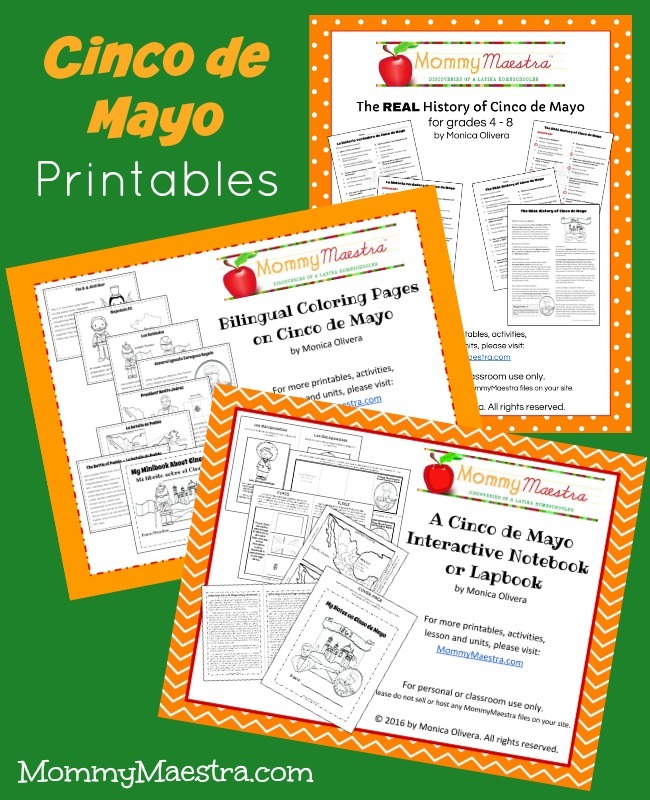 So if you are looking for some fun printables to help your children or students learn about the impact this holiday had on U.S. history, (did you know that the outcome of the U.S. Civil War could have been very different if it weren't for the brave men and women of Puebla?) check out one of my products. They are available for a variety of ages! Formerly known as a Bilingual Minibook on Cinco de Mayo, the full-page layout lent itself more towards coloring pages than a minibook, so I changed the name. :) This packet includes three sets of 8 coloring pages; one in English, one in Spanish, and the other bilingual. Each page is accompanied by text telling the story of the Battle of Puebla and its historical impact. If you've never used an interactive notebook or lapbook, check it out! They are so much fun because they allow your student to read, write, color, cut, and paste to make the learning experience more engaging so that they'll remember better. You can see examples of how the notebook goes together here. Only have time for a quick activity? This is a NO PREP one-page history on the Battle of Puebla and Cinco de Mayo. From Benito Juarez's decision to stop paying foreign debts for two years to the impact of the battle on U.S. history, this informational text is written for students in 4th - 8th grade. Includes an 8-question comprehension quiz plus answer key. Little Passports Science Expeditions & a Sale!